911uk.com - Porsche Forum : View topic - Anyone know what this number is?? 911uk.com Forum Index > 993 (1993 - 1998) > Anyone know what this number is?? Posted: Tue Mar 12, 2019 8:23 am Post subject: Anyone know what this number is?? 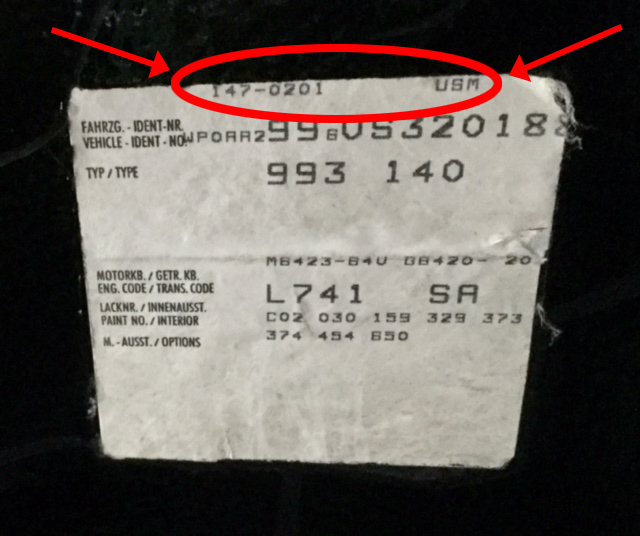 Anyone know what this number refers to (147-0201 USM) and what documentation it can be found on (as well as the VIN label)?? I'm guessing, but as process of elimination rules out early everything else, that it is the production line identifier for a specific car. On the production line all the individual component parts, common and unique/bespoke are delivered to the moving shell. There has to be something to make sure the right bits go to the right car. I've checked the records of the Porsches I have owned and that number doesn't appear anywhere other than on that sticker. So my label has worn and I cant make out that code. I am going to have another label made and have all the other data, so do you think there is no way of finding out that 'code'?? Out of interest, do you have a copy of the original invoice for your current Porsche as the code could be on there?? (I dont have mine)!! The factory might be able to link your VIN/WPO..... number to it but I don't how you'd find out for sure. Porsche GB might know who to contact. I have never seen an original purchase invoice for a new car so I don't know whether it would be on that. I suspect it wouldn't be. As a buyer, I would prefer to see the original [slightly bashed] sticker in situ. I wouldn't expect to see a twenty five year old piece of paper in immaculate condition and may smell a rat if it had been replaced - just a thought. I have found out that this is the production number of the car and the second part is the dealer code. 911smark - This is only found on the car label only, the book label doesn't have this code (or I have never seen it on the book label).